Let’s do the time warp. Again. Let's do the time warp. Again. Pitching themselves somewhere between the Wachowskis and the Strausses (of Skyline fame), German-born Australian writer/directors the Spierig brothers specialise in high-concept but cut-price B-movies such as Daybreakers (2009), which feature lots of indoor (and therefore cheaper to shoot) scenes, Antipodean actors pretending to be American (also, presumably, cheaper), and good-luck charmer Ethan Hawke (likely not that cheap) in the lead. Hawke has spoken eloquently about why he picks genre films that have a chance of crossing over (Sinister, The Purge) ahead of dumb blockbusters, and though he hasn’t yet hit the motherlode, they’re usually worth a look. 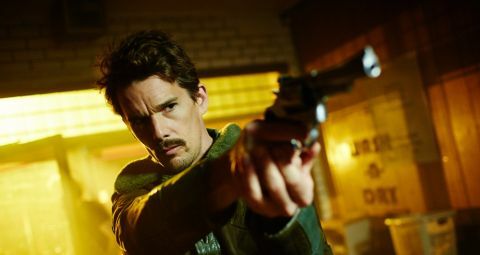 Based on a story that Starship Troopers author Robert A. Heinlein supposedly wrote in a day (All You Zombies), and with a similarly rushed-feeling script, Predestination is a tricksy, talky sci-fi noir that’s impossible to synopsise sans spoilers. Suffice to say Hawke is an agent for the futuristic Temporal Bureau, sent back through time to stop the elusive terrorist who killed 11,000 people in a New York of the past and has a moniker, Fizzle Bomber, that even the characters admit makes him sound a tiny bit rubbish. The ensuing account of “a paradox that can’t be para-doctored” is, indeed, a hell of a tale, especially if you haven’t seen any of the above. Shame that dialogue isn’t the Spierigs’ strongest point though. Because most of the film involves characters recounting things that have already happened, Predestination often feels like it’s all exposition, no action, although the Speirigs have hit upon a canny way of conjuring different times and places without a Hollywood-level budget. The result is consistently intriguing until it disappoints at the last, when the shifting foundations of the story prove less substantial than they appear. Compared to the rest of the time-travel canon, it doesn’t quite work, but it works so hard at not-quite-working, you won’t mind until the credits roll. VERDICT: Slick but overstretched, Predestination deserves respect for what it tries to achieve rather than dismissal for not getting there. Either way, you will not be bored.